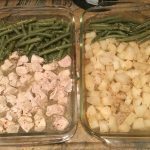 By now I think you all know that I am a sucker for a good one-pan meal. But if it also cooks in the oven, I consider that a double win (hello less cooking time!). That is why I am so excited about this new recipe! 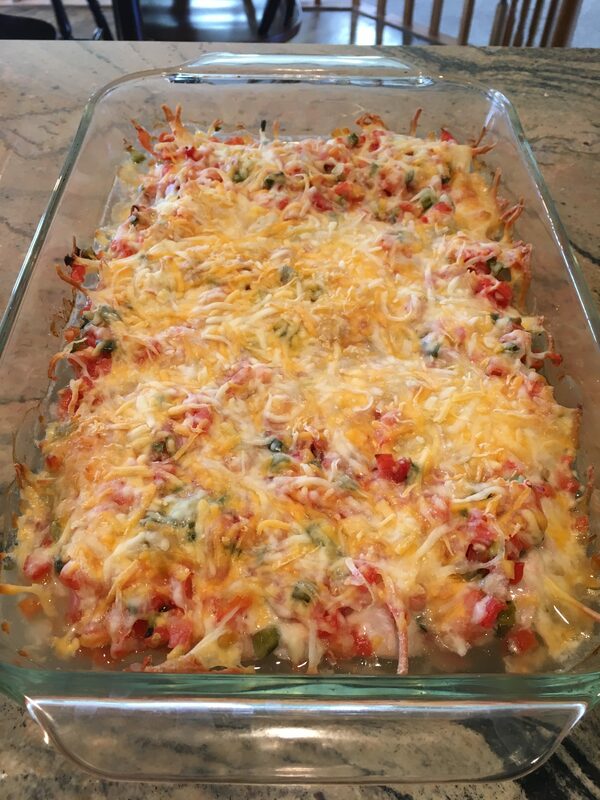 This Salsa Chicken Bake is healthy, contains a whole lot of veggies, but tastes amazing! Even the pickiest of eaters in your family will love it! 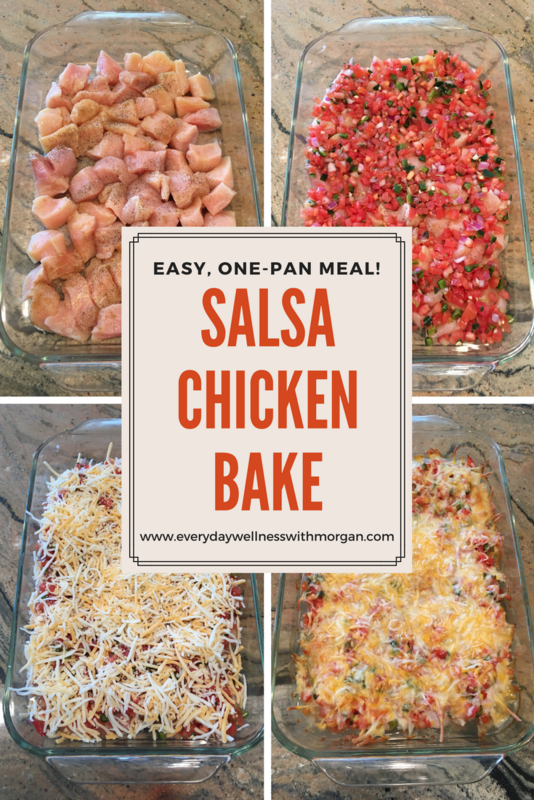 It is a wonderful one-pan meal that all bakes in the oven in about 30 minutes! Start out by preheating your oven to 375 degrees F and making sure the baking rack is in the middle of the oven. 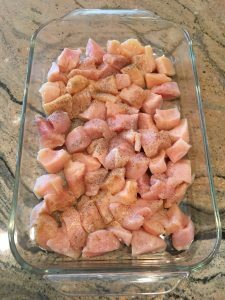 Then trim and cut up your chicken breasts into bite-sized pieces. Place these pieces in a glass baking dish in an even layer. Sprinkle your garlic, cumin, salt and pepper across the chicken. 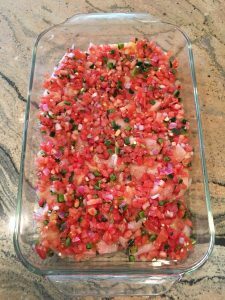 Then grab your fresh salsa and spread that out on top of the chicken in an even layer. 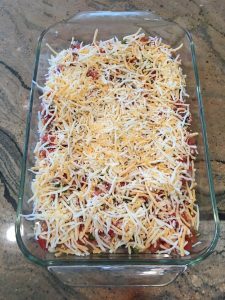 Finish up by sprinkling on your mexican cheese and the prep work is complete! Simply bake for 30 minutes, or until the chicken reaches an internal temperature of 165. 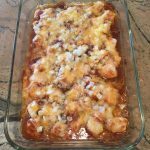 Either serve immediately or store in the fridge up to 5 days. 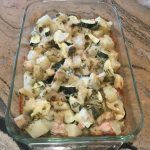 If you like one-pan meals like this, try my Pineapple Chicken Bake or Chicken & Zucchini Bake recipes! 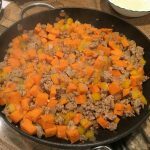 Other Sides – serve over mexican rice, plain rice, or even in tortillas for a delicious mexican meal!